To holiday in Delhi is to succumb to the chaos and charm of a sprawling and ancient city, which is full of surprises, and shocks. Delhi is a city of contrasts, part squalor and part exotic splendour. A quintessentially Indian city, the manic, noisy and labyrinthine streets of the old city give way to the imperial grandeur of New Delhi and its wide, leafy avenues. Visitors will see sprawling slums and marvellous palaces, abject poverty and glittering wealth, and be overwhelmed by the age and history of the city. A holiday in Delhi can be exhausting, unless you can afford air-conditioned luxury, so this is a destination for the adventurous and energetic. Shoppers will enjoy the experience of bargaining for unique and exotic souvenirs in the crammed street markets, while foodies can sample the North Indian cuisine that the city is known for in Delhi's numerous restaurants. The city's impressive array of attractions will pack any travel itinerary to bursting point, and Delhi is also the gateway to the fascinating Rajasthan region. Unless visitors are acclimatised to intense heat and can tolerate temperatures of up to 113°F (45°C) and beyond, they are strongly advised to avoid Delhi in the summer (March to July). Dust storms and high humidity during the monsoon season (end of June) may further add to the discomfort of travelling to Delhi in the hot summer months. The best time to visit Delhi is between November and March, when the weather is warm and sunny. To catch the colourful Hindu festival of Holi, book trips to Delhi in late February/March. Read more on Delhi's Climate and Weather. -Marvel at Jama Masjid, India's largest mosque. -Visit the residence of the President of India, the architecturally stunning Rashtrapati Bhavan. -See the ancient symbol of Islamic power in Delhi, the Qutub Minar. -Soak up the atmosphere at India Gate with its war memorial and green lawns. -Wander through the frenzied, exciting bazaars surrounding Chandni Chowk. -Spend some time admiring the flower-like Lotus Temple. -Explore Humayun's Tomb, one of the most beautiful examples of Mogul architecture in Delhi. -Stroll around the famous Red Fort, Delhi's landmark attraction. Delhi is the perfect springboard for travel in the north of India: Agra and the iconic Taj Mahal are within easy reach; the northern hill stations, like Dharamsala, residence of the Dalai Lama, are accessible; and cities like Amritsar, Jaipur and Varanasi are all possible destinations with plenty to offer travellers of all kinds. There are direct flights to Delhi from the UK and the US, landing at Indira Gandhi International Airport, which is located 10 miles (16km) southwest of New Delhi. It is the busiest airport in India and there are trains, taxis and buses available to take passengers into the city. Get more information on Airports in Delhi. 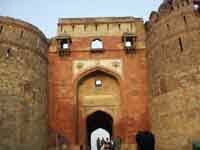 -The walled city of Delhi originally had fourteen gates; five are still standing. -Although Delhi is the capital of India, it is only the third largest city in the country. -Delhi has an International Toilet Museum. Travellers in Delhi will probably have to navigate through their fair share of sweaty crowds, persistent beggars and manic traffic. They are also likely to come face to face with some unpleasant smells, noises and sights. Regardless, the city is also home to astounding beauty, friendliness and wealth, with many treasures to be found amid the clamour of everyday life. Delhi is a city of contrasts, where an elephant can overtake a snazzy Italian sports car on the streets, where commanding colonial mansions stand next to overcrowded slums, and where cows are revered but musicians are labelled 'untouchable'. The city's pace is chaotic, yet strangely relaxed, making it ideal for exploring. Visitors are almost certain to have some strange and exotic experiences. With a long and troubled history, Delhi is full of fascinating temples, museums, mosques and forts, each with a distinctive architectural style. In Old Delhi, visitors will find a charming selection of colourful bazaars and narrow winding alleys. In comparison, New Delhi - the city created to reflect the might of the British Empire - consists of tree-lined avenues, spacious parks and sombre-looking government buildings. While Delhi itself could fill many holidays, the city is also ideal as a base for visiting the Taj Mahal in Agra, and provides the best links for travelling to the hill stations in northern India.